The Buff on slot 1 + 2 always remains for all Teams, whether you exchange the cards or not. 24/7 hours similar to the Gems. The heroes out of your team can also offer the synergy buff. It consumes Assist Medal and coins to refresh buff, but sometimes you may meet debuff. In the event, you can also choose Assist Medal and runes to refresh. 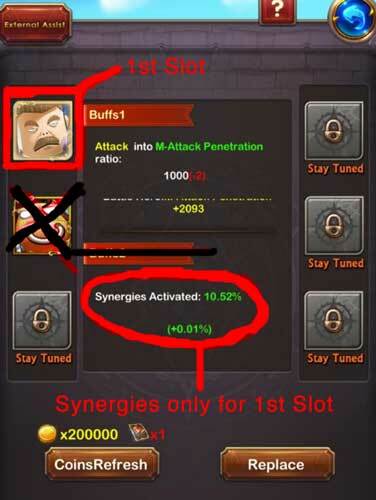 To increase Slot 1 or 2 you can switch between the two slots by clicking on the hero. You can see on the highlighted hero on which slot you are. But it is made somewhat unfortunate. If you look at the 1st picture, you think that MT in Buff 2 is for the synergies. This is wrong! It belongs to Brick on Slot 1 and it's a whole other topic. 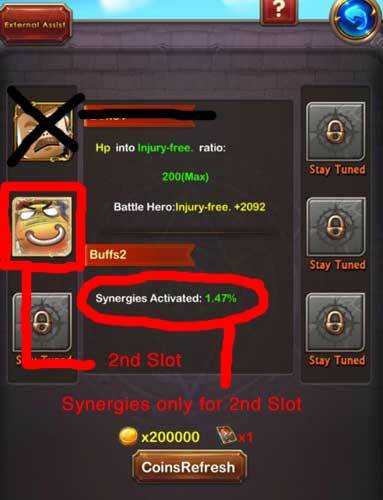 Each slot has 2 Buffs. We'll get to buff 2 = synergies later. It does not matter which Slot highlighted. Both are still active 24/7 hours. Which heros are the best for the buff? If you use a Hero in the Slot you can't use these card for your 3 teams or in Arena. You have to choose wisely. Or create a 2nd Hero for your external assist. How to increase the Buffs?